April 10, 2019, 3:16 PM · Members of the Symphony of Southeast Texas are rallying around the family of Yu Zhao Gu, 60, who suffered a heart attack and died during a performance last Saturday in Beaumont, Texas. Gu was sitting in the first violin section beside his wife and stand partner, Ying Zhao, when he fell from his seat during the opening work on the program. Audience and orchestra members rushed to his aid, with a cardiologist from the orchestra and doctors from the audience attempting to revive him until paramedics arrived, according to the Houston Chronicle. "It was a shock," concertmaster Matthew Detrick told the Chronicle. "The orchestra is very close knit, like a family...Something like this is very difficult." Symphony members set up a GoFundMe page to help Gu's family with medical and funeral expenses. 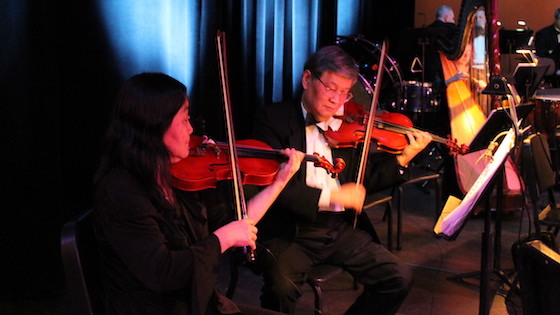 "Yu and Ying have been playing with the symphony for well over a decade and as regular members of the Galveston, Corpus Christi, Lake Charles, and Victoria symphonies," the GoFundMe page states. "The first to say hello at rehearsal, Yu could always be counted on to greet you with a smile and a word of encouragement." On his Facebook page Sunday, conductor Chelsea Tipton described Gu as "a valued member who has played with the orchestra for many decades along with his wife, and his presence will be dearly missed. Thank you to the doctors, nurses, and EMTs who came to his immediate aid on stage. And thank you also to the musicians and choruses for your work, love and support you provided last night and throughout the entire season. Please keep his family and friends in your thoughts and prayers." The incident occurred during the group's final concert of the season, "French Pairings," which was to include the "Bacchanale" from Saint Saens' Samson and Delilah opera as well as the Faure Requiem and Ravel's Daphnis et Chloe Suite No. 2. The orchestra is making plans for a repeat of the concert, according to its website. The orchestra is planning a memorial concert to honor Gu, according to the Beaumont Enterprise. Funeral plans have yet to be announced. Gu and his wife lived in Houston, and their son is a student at University of Houston. April 10, 2019 at 09:19 PM · How tragic! April 10, 2019 at 11:33 PM · Very much too young to go, and much sympathy to his wife and other survivors who lost a loved one. But from a distance I also see he left us doing what he loved, next to who he loved, and considering we all must go someday, he certainly did it right. April 11, 2019 at 02:52 AM · +1 to Will Wilkin. April 11, 2019 at 03:51 PM · My deepest condolences to the family. But I can't help but wonder: Since a GoFundMe page had to be set up, did he have proper medical care to begin with? A lot of people, especially with families, can't afford to use their healthcare even when they have it. Just a thought. April 11, 2019 at 08:25 PM · How tragically sad for his family and musical family. Also a reminder of just how fragile our lives are. A reminder to all to find as much joy as we can every day. April 12, 2019 at 02:30 AM · 75.70.171.103 -- What difference does that make? April 12, 2019 at 09:30 PM · I can't agree that there is good in someone who "died doing what he loved" when that person was only 60 and had a son still in college, not to mention his beloved wife right beside him, and an audience full of people witnessing his personal tragedy. That's an awful, traumatic way to go at much too young an age. My deepest condolences to his family and to all who knew and loved him.